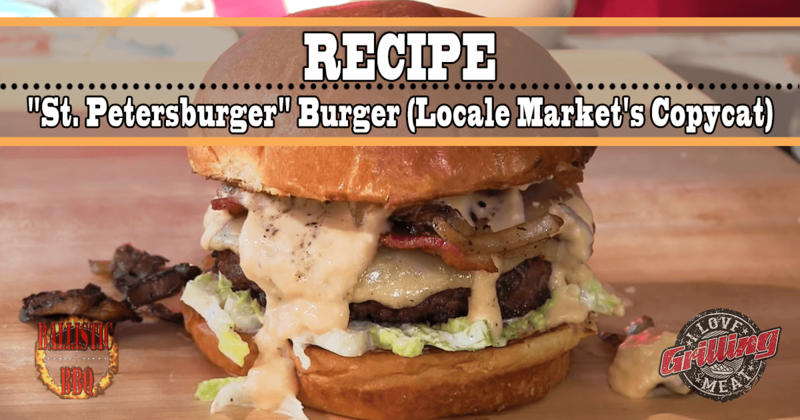 This St. Petersburger burger recipe might just be your new favorite cheeseburger on the grill. Feel free to thank Greg from Ballistic BBQ by inviting him to your next backyard cook out. First, grind enough dry aged beef for the number of burgers you’re going to make. Each patty should be about 10 ounces. First, mix your mayo in a small bowl with minced horse radish, buttermilk, salt and pepper. Smash the roasted garlic cloves and add them to the mix. Finally, mix in the agave nectar. Whip it up with a fork and place the sauce in the fridge! Then, shred the romaine lettuce, and prepare the onions that are going to be caramelized. After you prepare your veggies, then it’s time to move to the best part of this St. Petersburger Burger Recipe: the grill! Set up your pit for 2 zone cooking. First, we make the cheese dip. Place a pan over direct heat and immediately add the Queso fresco, Oxaca and Cheddar cheese, and finally some half-and-half. Move the pan over to indirect heat and stir the cheese mix while they all melt into a glorious creamy dip. Start by cooking up the bacon (3-4 pcs per burger). Once the bacon’s ready, cook the mushrooms and onions in the bacon’s grease. Then you’re going to want to allow the mushrooms to soften and the onion to caramelize. Next it’s time to grill your patty, start by seasoning with just a little sea salt. After flipping the burger, place a piece of smoked gouda cheese on the patty, and cover with a heat safe dish (e.g. pan lid) to make it melt nicely. Be careful when removing the cover, it’s going to be hot. Finally, let’s assemble the burger! Give the buns a toast, then place lettuce tossed in the sauce you made earlier. Top with the dry aged beef patty, bacon strips, onions, mushrooms, and finally cream sauce.